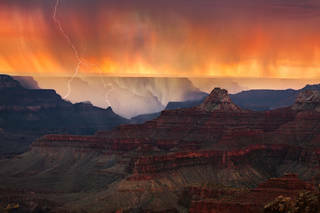 This workshop is scheduled to coincide with the full moon at the Grand Canyon. Weather permitting there will be an opportunity to capture the full moon rising over the canyon as the sun sets, and to capture the full moon setting as the sun rises. 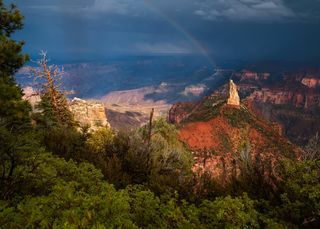 This workshop takes place during the monsoon season, which is a great time to capture the canyon with stormy skies and dramatic light. August 14, 2019: Meet and greet at 3:00 pm at Grand Canyon Lodge on the North Rim. We will then drive to Cape Royal for sunset. 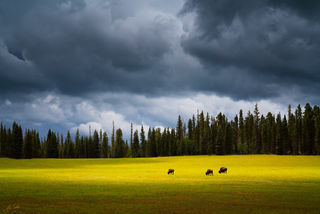 Topics covered include setting up your camera for landscape photography and Adam's technical workflow. We will also be setting up and planning for tomorrow morning's sunrise session. August 15, 2019: Sunrise shoot back at Cape Royal to capture the full moon as it sets just before sunrise. After sunrise we will drive back to the lodge for breakfast followed by a drive to the North Rim entrance in the search for bison. The afternoon and sunset session will be from the Walhalla Overlook. If weather permits, we will also photograph the night sky just as the moon is beginning to rise. 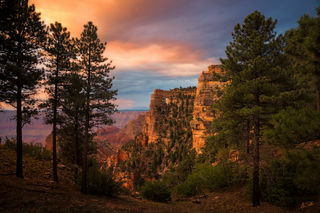 It will be an exciting session as the timing will be critical to capture the cliffs of the North Rim being lit by moonlight before the light from the moon rises too high in the scene and washes out the Milky Way. 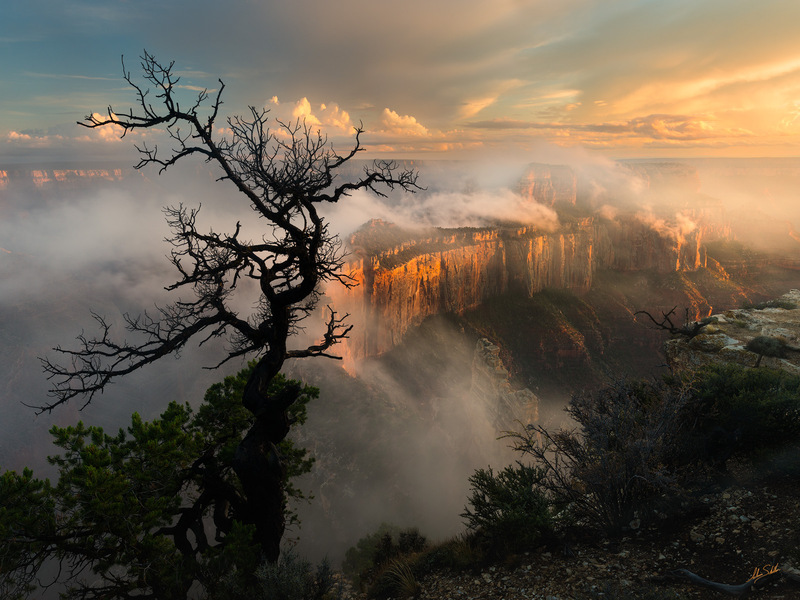 August 16, 2019: Sunrise this morning will be from an overlook near Angels Window. If the weather permits, there will be a follow-up session at Vista Encantada, and then we will return to the lodge for a late breakfast. Like the day before, after breakfast we will drive to the North Rim entrance in the search for bison as they often hangout in the meadows lining the highway. The afternoon and sunset session will be from a viewpoint near Cape Royal. If weather permits, we will also photograph the night sky with moonlight illuminating the canyon. August 17, 2019: Sunrise shoot at Point Imperial followed by breakfast at the lodge. 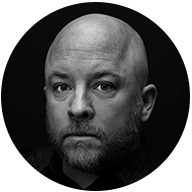 Adam will be available to answer any final questions you may have. 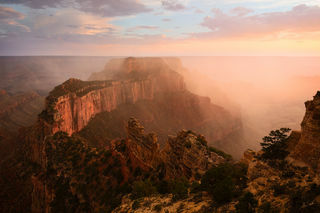 This workshop includes single-occupancy lodging in historic Frontier Cabins at the Grand Canyon Lodge on the North Rim. Meals are not included with the workshop fee, but the workshop groups often have a great time dining together. Transportation and entrance fees into Grand Canyon National Park are not provided. We will caravan to our destinations as much as possible. Due to limited parking, you are encouraged to share rides with your fellow workshop participants. For this workshop, we recommended that you fly through either Las Vegas McCarran International Airport or St. George Regional Airport. 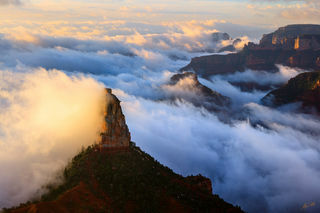 It is approximately a 4.5-hour drive from Las Vegas to the North Rim, or a 3-hour drive from St. George to the North Rim. The tuition for this workshop is $1,795.00. Your deposit of $500 will hold your spot in the workshop. The remaining balance will be due no later than 90 days before the start of the workshop. All of our standard Terms and Conditions apply. This workshop is limited to 8 guests, and it sells out fast. If you are interested, do not delay, sign up today. Got questions, send us a message. As always, my goal is to help you realize your creative potential, to have a great experience, and for you to return home with great photos!